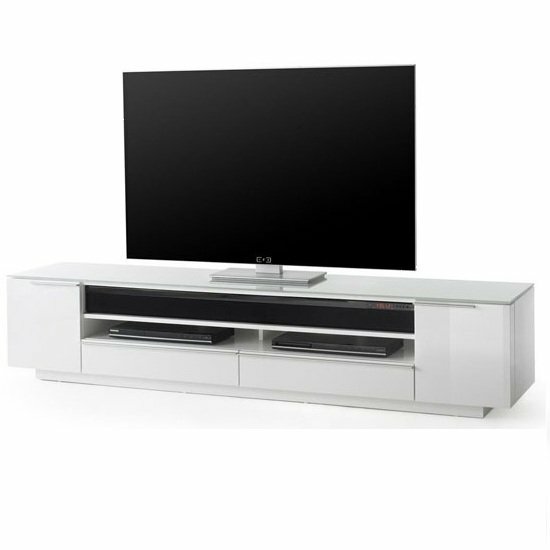 Intended for placement alongside one of the walls, linear TV stands for small spaces are usually very compact. The width of such stand depends on the width of the screen base and may be as narrow as 65 cm. Other construction features include shelves for placing additional equipment and safely hiding cables from sight and may also include castors for comfortable relocation of the TV stand. Corner TV stands are another popular accommodation option for small spaces. A compact corner unit may be located in the bedroom or small living room providing enough space for a large TV screen and leaving the center of the room open – an optimal solution for limited space. Have absolutely no room for a TV stand? Go for wall mounted TV brackets. This arrangement will let you attach your TV screen directly to the wall, and use the rest of the available space as you prefer. TV brackets help you get rid of clutter and free as much space as possible. Such solutions also look extremely stylish and attractive. TV stands for small spaces also differ according to material, allowing you to choose TV furniture that will suit your individual style and taste. TV stands from solid wood are a luxury these days, however, they still enjoy great popularity with those who favor traditional interiors. Some wooden TV stands for small spaces are made from reclaimed wood and are less pricey. These stands are usually made from high-quality MDF board covered with layers of high-gloss lacquer. Perfect for contemporary sleek interiors, such stands may also feature glass shelves and look exquisitely stylish. Another luxurious solution for small spaces is getting a TV stand made from tempered glass. Their transparency makes them great for small spaces, although it is also possible to order glass TV stands made from tinted glass. Such stands are easily integrated into modern hi-tech interiors and create unparalleled light and airy effect. Modern manufacturers offer impressive range of TV furniture for small spaces and it’s always best to shop for it at big retail stores. If you are looking for a combination of affordable price and optimal quality, try Furniture in Fashion . This trusted UK retailer cooperates with world renowned furniture brands, delivers to every corner of the UK within maximum 10 business days and offers incredibly reasonable pricing for each furniture item (not to mention regular sales and clearances). Moreover, 99% of their products advertised online are actually available for quick delivery and immediate purchase, and you can always check them out at their showroom in Farnworth.